This study focuses on the practice of punishment, as it is inflicted by the state. 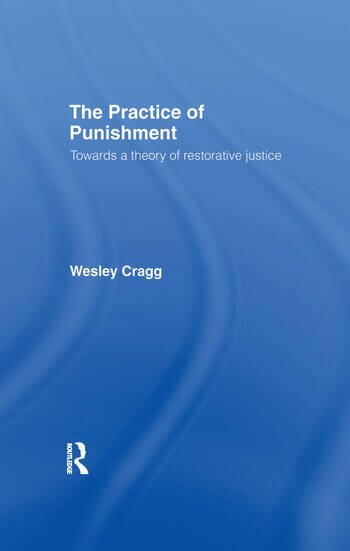 The author's first-hand experience with penal reform, combined with philosophical reflection, has led him to develop a theory of punishment that identifies the principles of sentencing and corrections on which modern correctional systems should be built. This new theory of punishment is built on the view that the central function of the law is to reduce the need to use force in the resolution of disputes. Professor Cragg argues that the proper role of sentencing and sentence administration is to sustain public confidence in the capacity of the law to fulfil that function. Sentencing and corrections should therefore be guided by principles of restorative justice. He points out that, although punishment may be an inevitable concomitant of law enforcement in general and sentencing in particular, inflicting punishment is not a legitimate objective of criminal justice. The strength and appeal of this account is that it moves well beyond the boundaries of conventional discussions. It examines punishment within the framework of policing and adjudication, analyses the relationship between punishment and sentencing, and provides a basis for evaluating correctional practices and such developments as electronic monitoring.